This is truly how I feel at the moment!!!! 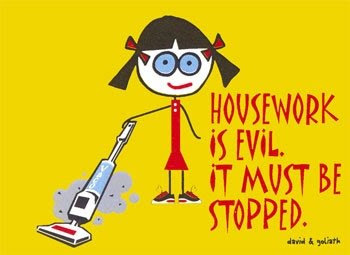 Life is really crazy and I must say housework is like a really bad case of hemroides..grrrr! A little birdie told me my neighbour's daughter loves housework...AMEN!!! So I have hired her to clean my house this summer. She starts next week and I can't wait! It feels like I am waiting for Christmas morning to arrive. Rene and the kids are all for this as I tend to get a little "crazy" when I need to start cleaning the house. There have been many occasions when I have threatened the kids to clean up their toys, as I head to their rooms with a garbage bag in hand. So there's my deep dark secret...what's yours? clean house makes for one happy mom!